Each week for six weeks James Slattery-Kavanagh complained to his GP about a problem in his legs. His doctor told him he thought the strange marks were insect bites. But James was sure there was a deeper problem. Eventually he could not walk and rushed to casualty, where doctors diagnosed a deep vein thrombosis. A year later James suffered from a pulmonary embolism - or clot in the lung. But doctors were still mystified at what was causing James problems. He was only in his 20s and had not been on any long distance flights and there seemed no obvious reason for his problems. But a series of tests revealed he was suffering from a genetic condition called Protein S Deficiency. Protein S is an anti-coagulant, but people with a deficiency are at greater risk of suffering from blood clots. He bruises more easily than other people, has bad varicose veins and poor circulation. He takes daily blood thinners so even a trip to the dentist takes weeks of planning to ensure that does not lose too much blood during any treatment. Protein S Deficiency is very rare and only affects about one person in 20,000 in the UK population. James found it was so rare that he had no-one to turn to for information and support. 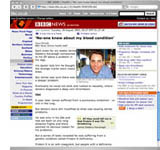 So the web designer set up his own page to allow sufferers like himself make contact and share experiences. Many people had worrying tales to tell. Some told of heart attacks or relatives who had suffered problems and others who had difficulty conceiving or sustaining a pregnancy because of their condition. He said the web-site helped users keep informed about medical breakthroughs, health insurance and useful advice about where to get medic alert bracelets, to warn people of their condition in case of an accident. He said the website helped to fill knowledge gaps. Dr Rooben Arya, consultant haematologist at King’s College, London, said patients like James could do certain things to avoid problems.